Killer Characters: I Can Do This, I Hope! I Can Do This, I Hope! When Oma (German for grandma), asked me to be her partner at the Sugar Maple Inn on Wagtail Mountain, I was thrilled. I love the inn almost as much as I love Oma. And I knew she needed a break. Running an inn is a 24/7 job. Guests have needs in the middle of the night sometimes. And no two days are alike. You never know what might happen next. Oma and her best friend, Rose, are finally off on a cruise! I was beginning to wonder if Oma would ever trust me enough to leave the inn for a vacation. I'm determined to prove that I'm capable of taking care of everything. We have a full house because Wagtail is throwing a murder mystery weekend called Murder Most Howl. I know that sounds dangerous because we've had a couple of real murders in Wagtail recently, but I can handle pretend "murders." This should be a snap. The ladies from the Thursday Night Cloak and Dagger Club will be arriving soon. With a name like that, they have to be fun! And the Tredwells are coming to adopt a dog through the If the Dog Fits program that allows them to spend a weekend with a dog before they adopt it. Cross your fingers for me. I need everything to go smoothly! By the way, you know how I said you never know what might happen next? I walked into the inn library the other day and caught Trixie and Twinketoes singing! You can see a larger version here. Trixie and Twinkletoes appear to have gotten hold of two copies of the book that they'd like to give away. Leave a comment here with your email address so they can get your mailing address if you win one! Good luck! Trixie and Twinkletoes are quite the duo! Cute video and they sing better than I do. I'm planning to spend my birthday reading their latest escapades with Mom, Oma and the extended family at the Sugar Maple Inn. Delightful! I'd love the chance to win, thanks! Della at deepotter@peoplepc.com . Looking forward to reading this. It looks like a fun read, so I'm hoping Thanks for the chance to win one. Means I'll get to read sooner if it works out. Sounds like a crazy busy time! The book looks terrific. This sounds like a howling good story! I'd love to win. What a nice giveaway. The book sounds very interesting. I absolutely love this series!!! I've been rereading the first 2 books trying to contain myself until this 3rd one comes out. Escaping to Wagtail is the best getaway for me from my high-stress job and a year of health issues. I never tire of the stories and learn something new every time I go back. Thank you for such loveable characters! Trixie and Twinkletoes have very nice voices for a cat and dog! I've got my fingers crossed that I win one of those books. Hope I can get a copy!!! If I don't I will still buy it. I love this video! And I can't wait to see how the mystery weekend turns out - guessing might get a little exciting. Thanks for the giveaway. I laughed so hard when I saw this video! How creative is this. I wasn't expecting it it certainly gave me a smile for the day. I needed that after going to the vet, basically having my dog destroyed the building before I left. Somehow I think they prefer downloads from the in a close to my big, hairy, dog that's plain crazy! I can't wait to read this new book! Thanks for this opportunity! This book sounds wonderful! 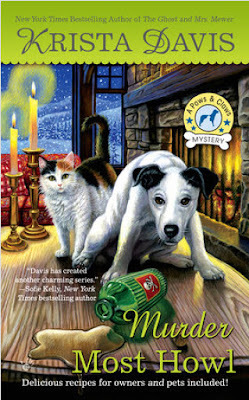 I absolutely adore cosy mysteries with cats and dogs. As a Certified Crazy Cat Lady, this book would be right up my alley. Would so love to win a copy to read and review. Thanks for the great giveaway. Happy Friday Trixie and Twinkletoes! I loved your video. You can do it Holly! I loved the video. My favorite part is when Trixie chimes in. I love the voice! I also like how all of the important details about the book were shared. Thanks for the chance to win! how much fun would this be! Love this series! Can't wait to read the latesr adventure. Loved the video and would love a copy of the book even more! love Trixie and Twinkletoes.....and love this series.. I am looking forward to reading my copy! I have only read the first in the series. I need to get caught up. It is a very fun series! Really liked the video, I'd love to win the book. Thanks for the chance. My dogs want to read this story with me. Thanks for the chance. My dogs LOVE my 'library'. They make their way through books faster than I do. However, I use my eyes and they use their teeth, so I think we get different things out of them. luann(dot)braley(at)gmail(dot)com. Enjoyed the video. I'm looking forward to reading this book. Thank you for the chance to win a copy of MURDER MOST HOWL. I'm reading - and loving - THE GHOST AND MRS MEWER now and would be thrilled to win MURDER MOST HOWL. Cute video! Such a cute video and the book covers are great. I'd love to win one of the books. My email is musiqmom@yahoo.com. Thanks for this opportunity. Cool. New author for me. kamundsen44ATyahooDOTcom. Love the book description and would LOVE to win! Looking forward to reading Murder Most Howl. I just love visiting Wagtail. Thank you for a chance to win! Doodlesink@hotmail.com Have a wonderful Thanksgiving! Always great reads, cute covers, just talent all throughout! Would LOVE to win one....whether I do or not, Happy Thanksgiving and Merry Christmas to you and your family!! I'd love to read this (if I'm not too late). Cute video. My dogs bark and howl but they don't sing ever. At least not when I'm around.